Fighting Irish Thomas: ND victory(s): Jimmy "Santa" Claus-en leads Irish over Hawaii, but does the Weis-man take down Obama? ND victory(s): Jimmy "Santa" Claus-en leads Irish over Hawaii, but does the Weis-man take down Obama? 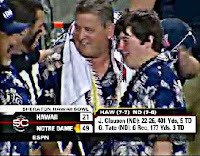 Certainly, Notre Dame's decisive 49-21 Hawaiian Bowl victory over the host Hawaii Warriors accomplished volumes just on the Fightin' Irish football surface. Playing on the eve of the holiest day save Easter, the Domers not only silenced their critics and exorcised the demons of past bowl games, putting an end to their dubious NCAA record of nine consecutive bowl losses (a fact ESPN unfailingly reminded its viewers over a hundred times a day in the weeks leading up to the contest), but honored Her namesake and payed homage to Her Son's sacred day in the process. Noble deeds indeed ... but did their immobile coach uncover something far greater in the process? First, let it be stated that Jimmy Clausen's final sophomore performance proved that, given time and talented receivers, the California Kid can throw the football. Passing for 299 yards in the first half alone as the Irish jumped to a 28-7 halftime lead, Clausen exited the game in the third quarter (unlike BCS big shots Florida and Oklahoma, Notre Dame refuses to run up the score, sending in the subs when the contest is no longer in doubt) and finished the game 22-26 for 406 yards and five touchdowns. And, considering three of those incompletions were drops, Clausen and the Irish receiving core, led by Hawaiian Bowl co-MVP Golden "Frankincense and Myrrh" Tate (6 catches, 177 yds, 3 TDs) were about as close to perfection as possible. And, with the Irish offense scoring six points on six consecutive possessions, the ND defense racking up two turnovers and eight sacks, and the special teams recording a blocked punt, a kick-off return of 96 yards by Armando Allen, and nearly a punt run-back by Tate (erased because of roughing), you can see why Coach Charlie Weis, who stated, "The only thing I want for Christmas is an Irish win," went home a happy man. But was there another reason that the Irish were playing in Hawaii? Obviously, with a regular season record of 6-6, Notre Dame wasn't going to a BCS game. And yet, with their famous name, the Irish still had their choice among the lesser bowls. And why exactly was Coach Weis coaching from the press box? True, Charlie had blown out both his knees after being run over on an out-of-bounds tackle during the regular season, making standing difficult and the sidelines dangerous. But could there have been an even more important, even more dangerous reason? Rumor from a reliable Irish patriot had it that, besides calling the plays from the press box, Coach Weis was running a covert operation, coordinating an undercover pro-life effort to storm the Hawaiian statehouse and uncover President-elect Obama's fraudulent birth certificate, proving that he was not a natural-born citizen, thus rendering Barack ineligible for the presidency. Unfortunately, the patriots forgot to change their pro-life t-shirts, and since being openly against abortion is practically a crime already in parts of Hawaii, they were picked up for being suspicious characters, some claiming the police were alerted by Obama's secret service (the prez-elect was vacationing, if not worshipping, in Hawaii over the holiday) themselves. In any event, their detainment critically ruined the timing of "Operation Leprechaun," quite possibly forever, and Weis (after his two knee operations) has to go back to being only the Notre Dame football coach. Ah, but 2009 may be a different story. A strong recruiting class, lots of prayers, plus the fact the Irish are playing Southern Cal in South Bend just may be enough for Notre Dame to once again knock the dreaded Trojans off their high horse. Similarly, and more importantly, with strong writers, dedicated pray-ers, and devout followers being added to their numbers every day, 2009 may be the year that RenewAmerica and other Christian Web sites break the deadly stranglehold the Obama administration has on this nation as well.